Yarra Valley vineyards, seen from Balgownie Estate, Victoria. Afternoon view from the Balgownie Estate Vineyard resort in the Yarra Valley, Victoria. My wife and I drove to the beautiful Balgownie Estate Vineyard and Spa to relax after the Melbourne Cup festivities. When we arrived, we sat out on the front deck where we enjoyed a glass of wine and a charcuterie plate of delicious local meat delicacies. The view was stunning. 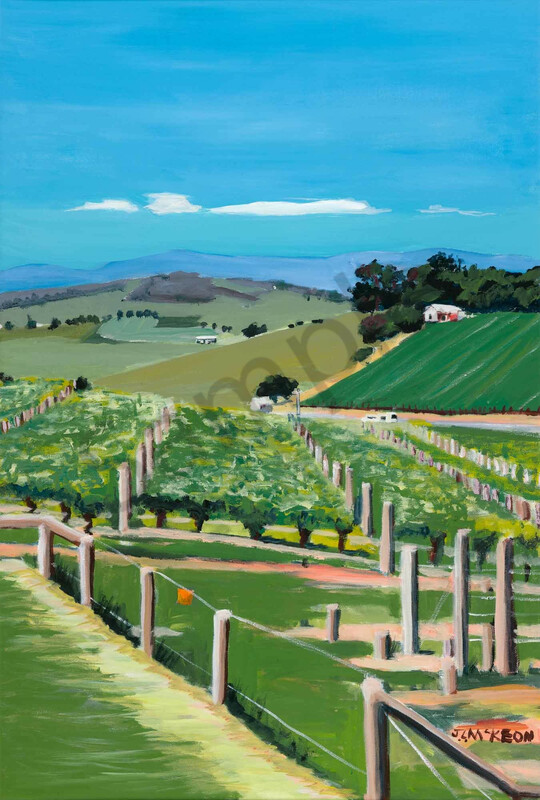 I tried to capture this feeling in bright, acrylic colours which move from the cool blue sky above the mountains to the warmer green colours of the vineyard.